ONCE AGAIN AT PDAC 2016! 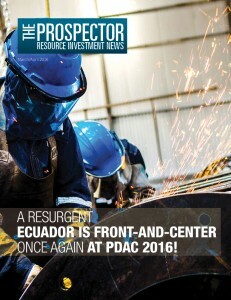 Ecuador is again this year one of the country sponsors of PDAC. Goldsource Mines, Inc. proves benefits of thinking globally, hiring locally. Canada is the world’s fifth largest oil and gas producer and its energy export revenues are a significant part of the economy. Silvercrest Metals brokers peace between long-feuding mining families, re-open mine. The uranium spot price soared from $10/lb U3O8 in 2004 to a peak of $135 in the spring of 2007 and then collapsed back to $40.